Perkoff was a central figure in the Beat Era period in Southern California. 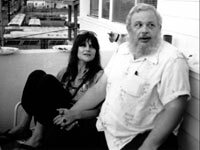 He influenced and encouraged many, including the poets profiled in Venice West and the LA Scene. It is fortunate that many of his readings were recorded and preserved. We have been able to use several of his poems from these audiotapes. He opened Venice West Café in 1958 and provided a place for the underground to read their poetry and exhibit their artwork. Writer Lawrence Lipton was so intrigued by the group that he wrote “The Holy Barbarians” which chronicled their exploits. Years later, John Maynard wrote “Venice West” which told more of the history of Stuart Perkoff and his poet pals, Tony Scibella and Frank Rios. He died in 1974. Will, in fragile health and in a wheelchair, died a year after his interview in 1997. He was a major figure in the poetry world of both San Francisco and Southern California. During the 50’s he and Poet, Bob Kaufman, published “Beatitude” in North Beach. By the 60s he had moved to Venice and became part of the Temple of Man, a repository and archive started by Bob Alexander, which includes both written and artistic work produced by this underground cultural group. After the death of Alexander, Margolis took over the written archives of the Temple of Man. His home contained countless copies of rare publications from the 50’s and beyond, which have now been preserved by other members of the group, still active today. Charles took photographs of his friends, the underground artists and poets in Los Angeles during the 50’s/60’s. Fortunately, he captured the scene; otherwise, there would be almost no visual record of it. He didn’t take snap shots. All are beautifully composed and outstanding photographs of individuals who influenced his life and creativity. Brittin also became involved in the civil rights movement and had his camera ready to document the brutality he experienced while marching with demonstrators. In 1999 there was a retrospect of these photographs as well as those he took of his 50s companions at the Craig Krull Gallery in Santa Monica. This gallery published an excellent book of his work from that show. Over the years he has continued in his chosen field of photography and has been exhibited in galleries and museums throughout the world. Now his photographs are in the archives at the Getty Museum in Los Angeles. Charles died in January, 20ll a few months before the opening of his exhibit at Michael Kohn Gallery in Los Angeles and publication of Kristine McKenna's book of his photographs. In the late 50’s Philomene was in a convent at the top of the Santa Monica Mountains. Moments before she was to take her vows to become a nun, she changed her mind and escaped down the mountain, ending up in Venice. She eventually met Stuart, Tony and Frankie. Having written poems earlier, it was natural for her to continue her writing and find a home with the Venice poets. She became Stuart Perkoff’s companion during the last part of his life. Over the years, Long also did a couple of short films--one called “The Beats”, which contains comments from several luminaries of the beat generation. She has contributed two excerpts from this film for my documentary. Another of her varied works was “Bukowski in the Bathtub”, based on visits and conversations between her husband, John Thomas and Charles Bukowski. Sadly, there will be no more from Philomene Long, who died tragically, August 2007. She will be missed. Thomas hitchhiked out to California from the East in 1959. The ride that took him to Los Angeles left him in Beverly Hills so he spent his last bit of cash to take a bus to Venice. He quickly became part of the underground in Venice, writing poetry and cooking the meals that were given free of charge to artists and poets at the Gas House. Over the years, John wrote several books and volumes of poetry. He and his wife, Philomene Long collaborated on various writing projects. “LA Exile, A Guide to Los Angeles Writing 1932-1998” published in 1999 profiled John Thomas along with other renowned writers like Faulkner, Fitzgerald and Steinbeck who lived and worked in Los Angeles. John Thomas died in 2002, a very sad loss for his wife, Philomene. Tony came from a blue-collar background. After his stint in the Korean War, he made a radical shift in his life and started painting. He was turned on to poetry by the influential Venice poet, Stuart Perkoff and soon became part of the underground group in Venice. Over the years he maintained his commitment, dedicating his life to writing poetry. Scibella provided much of the narrative for the documentary, reading from “the kid in america”, which are his reminiscences of that time. Tony Scibella died in October 2003 before the completion of this documentary but his spirit lives on in Venice West. Rios had been a heroin addict in New York City. He came to California and fell into the Venice poetry scene, meeting Stuart Perkoff and Tony Scibella. With their influence and encouragement, Frankie found his own voice and became a poet; ultimately changing the direction of his life. Even though he continued to struggle with addiction and spent time in jail, he kept writing throughout those chaotic years. Finally, he was able to kick his habit and stay free of drugs; writing his poetry without the added difficulties of an addict lifestyle. He also created outstanding collages that displayed his visual talent. A long life spent in poetry and art ended when Frank Rios died August 20, 2018. Saul, part of the Venice avant-garde group of artist and poets, was first and foremost, a painter; although he continued to write poetry throughout his life. He read his poems and those of Stuart Perkoff, often performing live with a jazz group. His death in May 2003 is particularly sad in lieu of the fact that in the last couple of years of his life he had begun to receive some recognition for his strong, abstract paintings with several gallery exhibitions as well as an exhibition at San Jose Museum of Modern Art in November 2003. Aya was part of the poetry scene in both Venice and San Francisco’s North Beach, living in both areas during the Beat Era. She and David Meltzer first met in a poetry class in Los Angeles during the 50s. Then, later they read together at the 6 Gallery in San Francisco after she moved to San Francisco. Her husband then was Elias Romero. He performed the first “Light Shows” at bars and coffee houses in North Beach while Aya read poetry. Throughout the years, she’s been involved in many endeavors. Continuing to write poetry, she also collaborated on short films and a documentary. She is an astrologer and Zen Buddhist. Artist George Herms’ Love Press published her book, “Zen Love Poems.” Her own distinctive drawings have been used to illustrate much of her published poetry. She was editor for Matrix, one of the first spiritual/feminist/literary journals published in the early 70s. Aya’s non-fiction book, “Way of the Warrior Priestess” is available on Amazon.com. Her most recent book of poetry is “She Arising.” Sadly, no more poetry from Aya who died September 3, 2016.
loss to all who knew and loved him. His legacy is extraordinary.